Veterans Andy and Ashley Williams know a thing or two about buying, selling and renting homes — especially when the process involves a quick turnaround that may be all too familiar to military families. The couple, owners of Recon Realty, recently shared with Military Times a few tricks of the trade that may come in handy for your next permanent change-of-station move or real estate transaction. 1. Top target areas. What can military families who are selling a house do to make their home more attractive? “If they’re looking to move and add value, kitchens and bath are always what you’ve got to work on,” said Andy, a former Marine. Some suggestions include new countertops, new flooring and fresh paint. Before there were cameras, the stars of HGTV's "Flip or Flop Forth Worth" were helping fellow veterans transition into the real estate industry. This doesn’t necessarily mean you have to shop at the Home Depots of the world, he said: The Williamses frequent places that sell remnants of granite, quartz and tile for about half the cost. Thinking big? Consider knocking down a wall to give the space an open concept, Andy said: That should add value. 2. Affordable accents? Army veteran Ashley’s top retailers for accents are Amazon, Wayfair — especially for lighting options — and brick-and-mortar retailers such as Marshalls, TJ Maxx, Michael’s and Hobby Lobby. “You don’t have to spend a lot to have something really fashionable, and most girls know that,” she said. 3. Rental re-do. 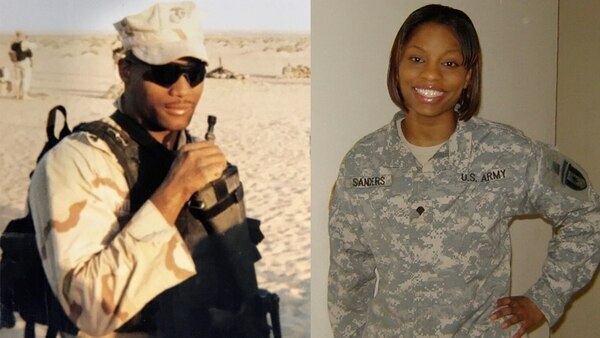 Transitioning between duty stations often means living in a house you don’t own, Ashley said. If the landlord’s taste doesn’t necessarily match yours, she recommends sprucing up the place with wallpaper-esque options that peel and stick on walls without damaging them. You can also try wall art, or even a piece of wallpaper in a picture frame. Adding color throughout the home, even via subtle accent pillows and throws, can help as well. 4. New-home horrors. If you’re buying a home with limited time to inspect it yourself, a home inspection report is critical, Ashley said. Unless you’re planning a major renovation, stay away from properties with roofing, plumbing, electrical, foundation or heating/ventilation/air conditioning problems. “Those are the five areas that will eat up your budget extremely fast and potentially turn into money pits, depending on how bad they are,” she said. If you decide to go for a fixer-upper, get bids from at least three contractors before you commit, Andy said.